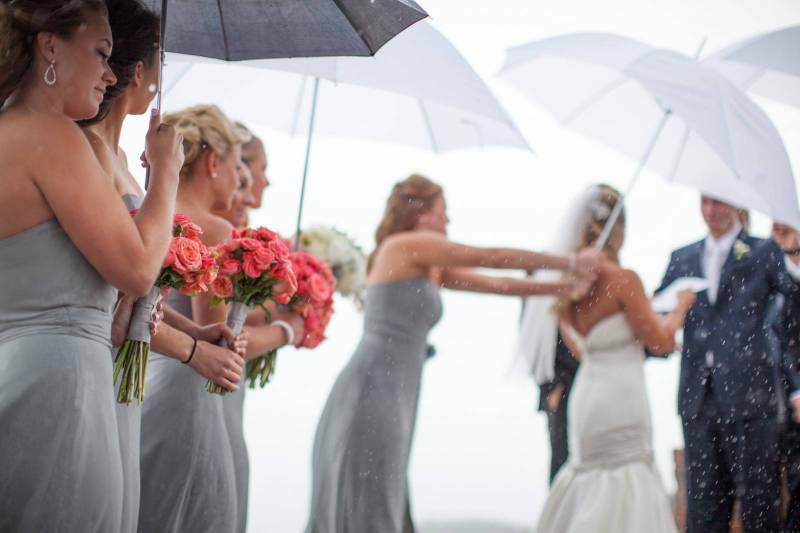 Plan ahead of time so you aren't thrown for a complete loop if it showers on your wedding day, and if it happens to rain embrace it. Laugh, celebrate and make the most out of everything you have. Have a small back-up weather budget for all the last minute adjustments in case it rains. A rainy day fund (literally). This will let you get creative and take care of your guests without as much stress. 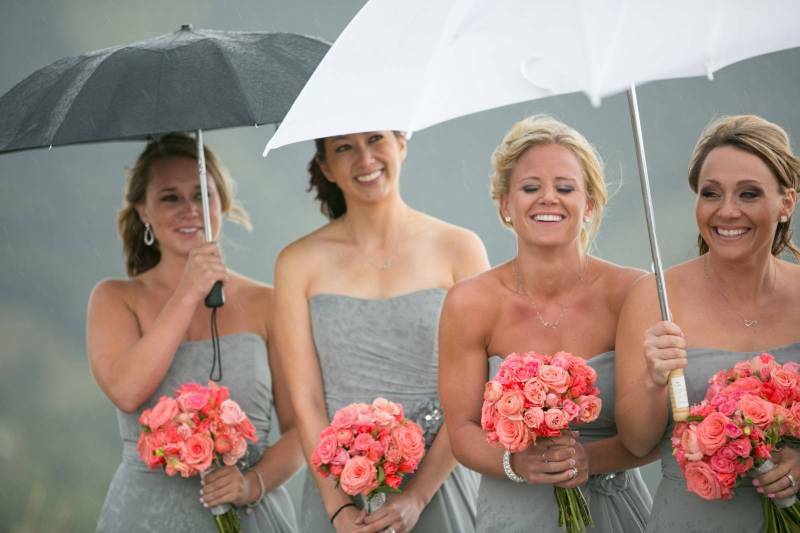 Talk to your photographer about a rainy wedding day beforehand. 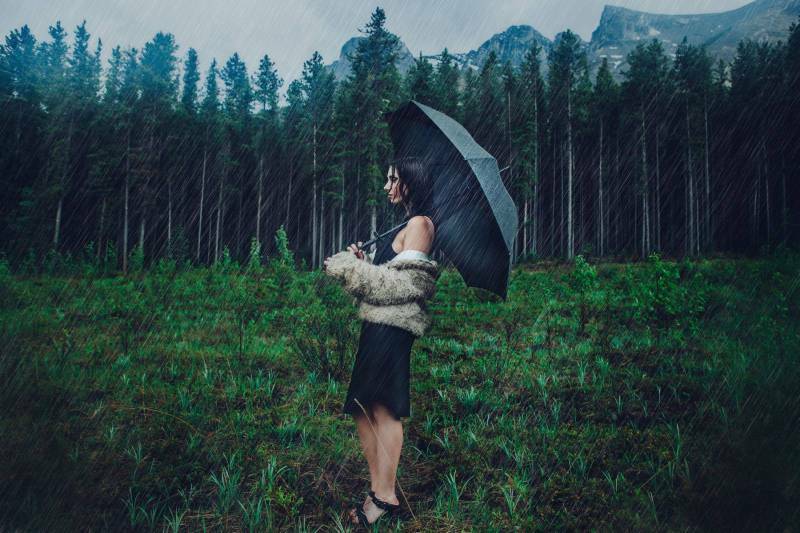 You're photographer should have experience shooting in the rain (check this out beforehand) and can help you come up with some creative ideas and a plan in case you wake up to rain that morning. But don't worry too much, the lighting on a rainy day can be amazing for wedding photos. 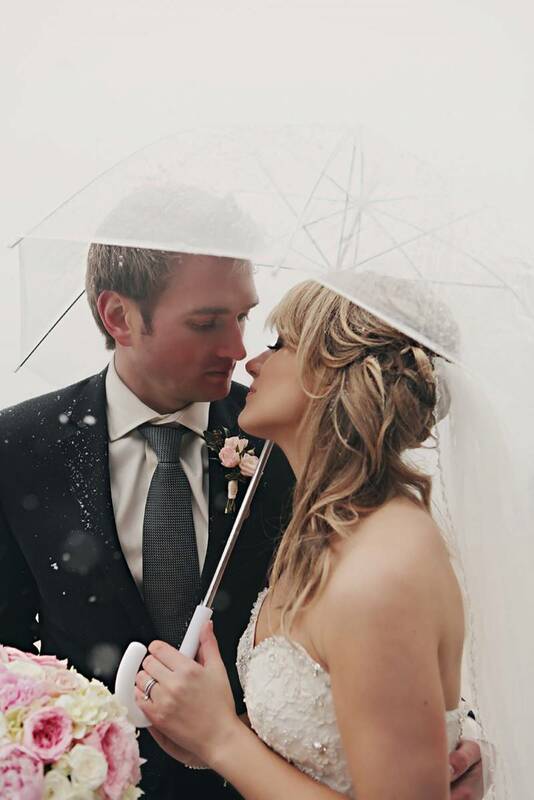 If it rains an umbrella is an obvious must but you can find some pretty adorable and chic umbrella's that can make your rainy day wedding photos absolutely fantastic. 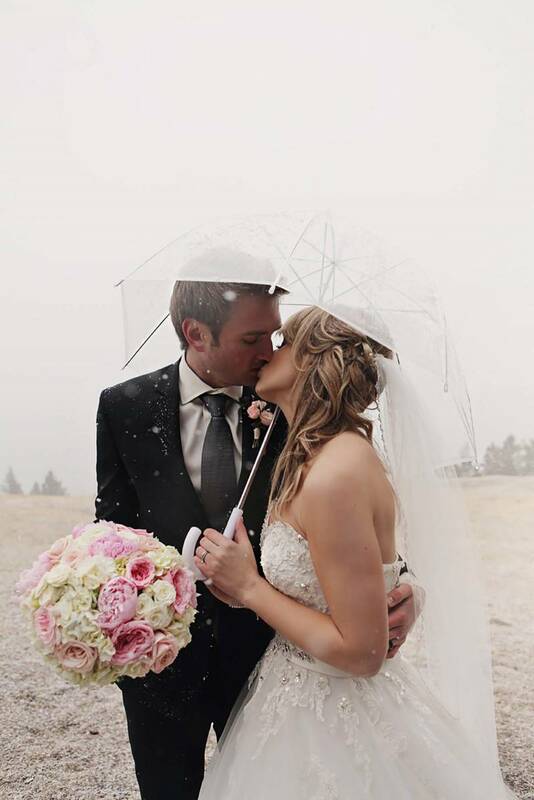 Calgary wedding photographer, White Dress Photography used this incredible vintage clear umbrella to turn this slushy weather into the most romantic and amazing wedding photos. You can also have pretty parasols on hand for all of your guests and give them as gifts to your bridesmaids. Embrace the umbrella and have fun with it. Be flexible with your schedule of the day. 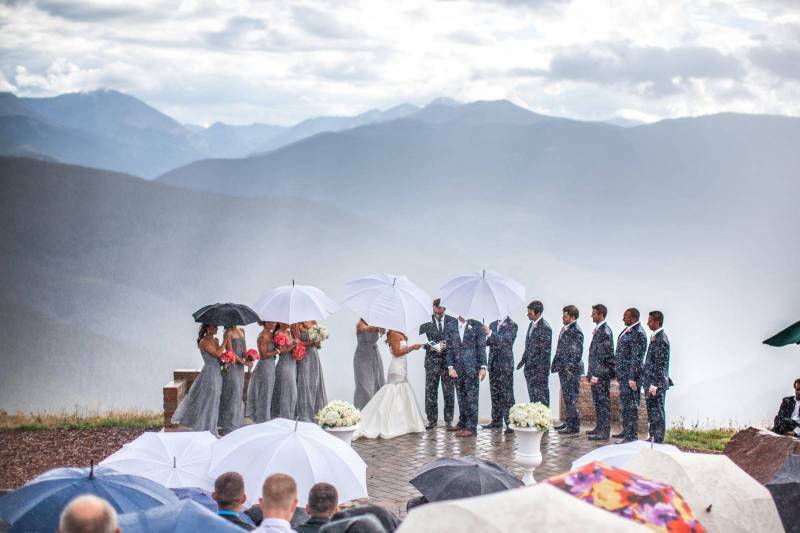 If it looks like there will be a torrential downpour right during the time of your vows you can change the schedule a bit. Shorten the cocktail hour or start the reception a bit later. Guests won't mind a bit of a change in plan if you are helping to keep them dry. Adjust your hair. If your hair frizzes easily switch to an up-do or a messy bun instead and be sure to put on waterproof mascara and work with your makeup artist to create a waterproof and lasting look for the day. A good team of hair and makeup experts can help make sure you look gorgeous all day long. Along with the rain temperatures tend to drop but a fur stole or gorgeous wrap is the perfect way to stay warm and look great.